A newlywed couple were forced to watch on as their baby boy was saved from the third-floor of a burning hotel, as two guests died in the devastating blaze. 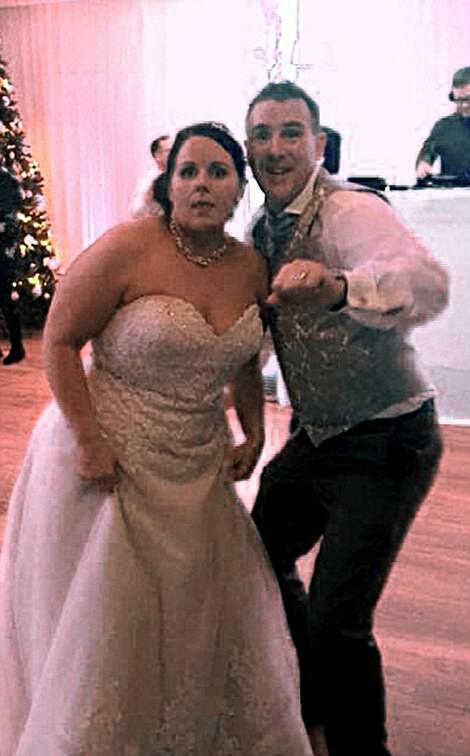 Andrew and Louise Logan were on their honeymoon, having married on Friday, when they were caught up in the horror fire at the five-star Cameron House hotel on the banks of Loch Lomond. An incredible photograph captured the moment their son Jimmy was rescued from the flames by a firefighter, who held the youngster under his arm as he climbed down a ladder. One guest was pronounced dead at the scene while another later died at the Royal Alexandra Hospital in Paisley, Renfrewshire. As dozens congregated outside the blazing building, the honeymooners and their baby were taken to hospital for treatment for smoke inhalation. They were later discharged. The £80million hotel is said to have had showbiz guests including Robbie Williams, Cameron Diaz and Sir Sean Connery. The blaze produced a huge plume of smoke that could be seen for miles all day yesterday. 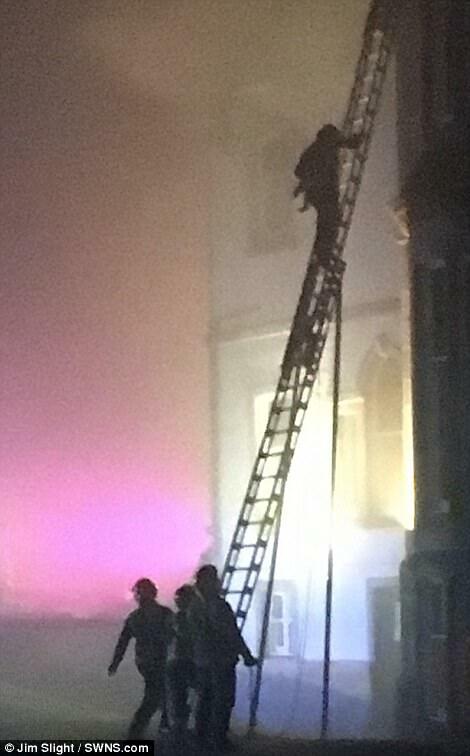 Firefighters said it had left the hotel, which dates back to the 18th century, extensively damaged. At the height of the blaze there were 14 appliances and more than 70 crew at the scene. They were still putting out pockets of fire as darkness fell. 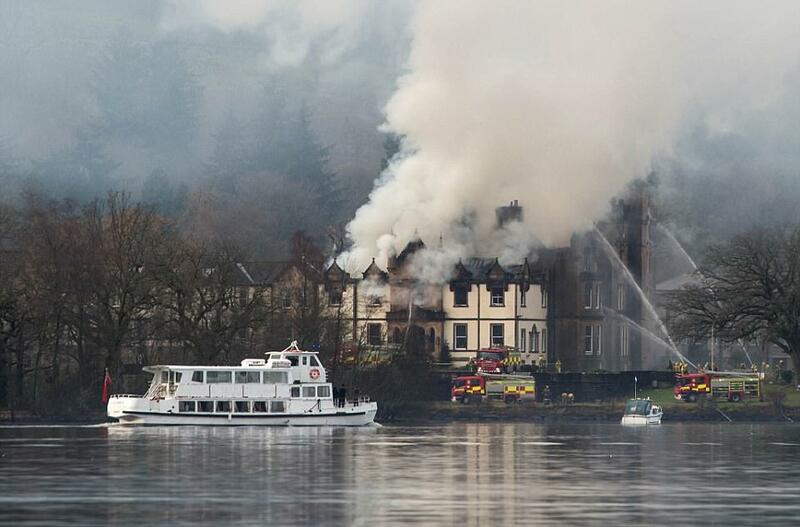 Hotel guests – many wearing little more than bath robes – were taken to the hotel’s Boathouse restaurant while fire crews fought the blaze a few hundred yards away. From the safety of the restaurant, many posted messages on social media to let their loved ones know they were all right. Jim Slight, 57, from Dalkeith, Midlothian, described the horrific scene as he and his wife fled. Mr Slight, who had been celebrating his birthday at the hotel, said: ‘The alarm went off at 6.40am. We exited via a fire door and then walked past the front of the building and the main entrance. 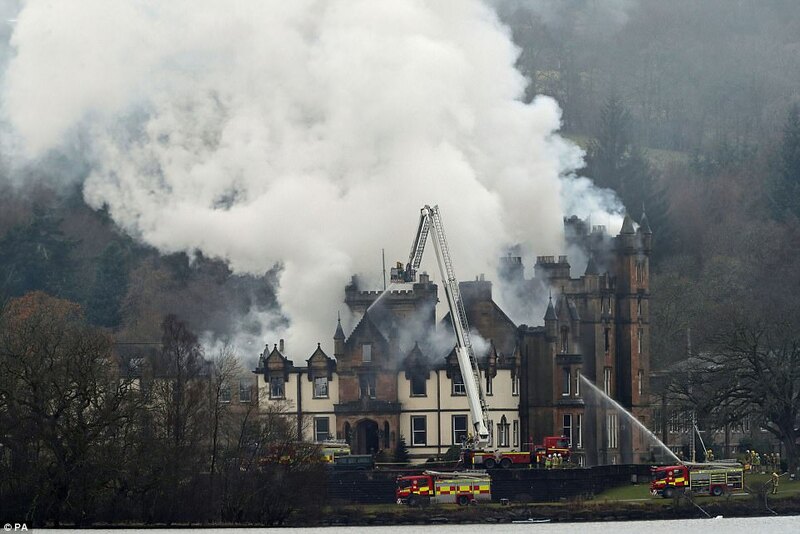 Police Scotland said it was too early to say what had caused the fire at the hotel, which left the central section severely damage. Cameron House is a popular wedding venue and houses the Michelin-starred Martin Wishart at Loch Lomond restaurant. It last changed hands for around £80million in 2015. One guest Ainsley Huxman told BBC Radio Scotland: 'As soon as we left our room - I just thought it was a fire alarm, just like a practice go. 'But when we left - five stairs down from our room - we saw a whole room full of smoke and flames. 'So we had to run back down the hall, chapped on everyone's doors and shouted 'fire!' We got out within five minutes of the fire brigade getting called. A spokesman for the Scottish Ambulance Service said: 'We received a call at 6.44am today to attend an incident at the Cameron House Hotel. 'We dispatched four ambulances, our special operations response team and the trauma team to the scene. 'Three patients, two adults and one child, were taken to the Queen Elizabeth University Hospital. 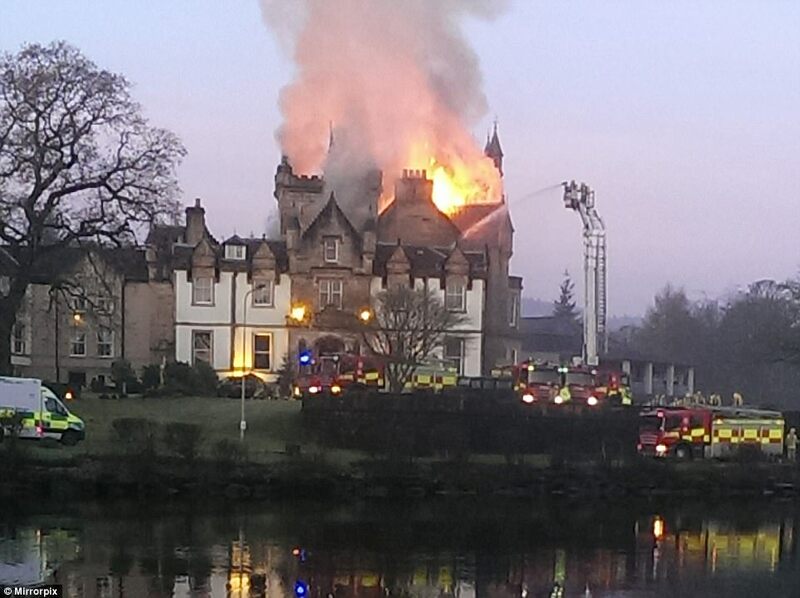 A Police Scotland spokeswoman said: 'Two people have died following a fire at the Cameron House Hotel earlier today. 'Around 0650 hours, police were called to a report of a fire at the hotel. More than 200 guests were evacuated from the building which has been extensively damaged. 'Officers remain at the scene and are working with other emergency services to establish the exact circumstances of the incident. 'One person was pronounced dead at the scene. Four people were taken to hospital, one to the RAH who later died. A further three people were taken to the Queen Elizabeth University Hospital for treatment. The hotel is a popular wedding venue, has a championship standard course for golfers and houses the Michelin star Martin Wishart at Loch Lomond restaurant. The luxury hotel is owned by US investment firm KSL Capital Partners, which was reported to have paid between £70 million and £80m for the 132-room property in 2015. The BBC reported that some staff members had only learned about the fire when they turned up for their shifts at the hotel on Monday morning. One worker told the broadcaster she did not believe reports of the blaze until she saw it for herself. 'It's a really lovely hotel, I'm so sorry to see this,' she said. First Minister Nicola Sturgeon tweeted: 'This is absolutely dreadful news. My heart goes out to the loved ones of those who have died, and to all those affected. 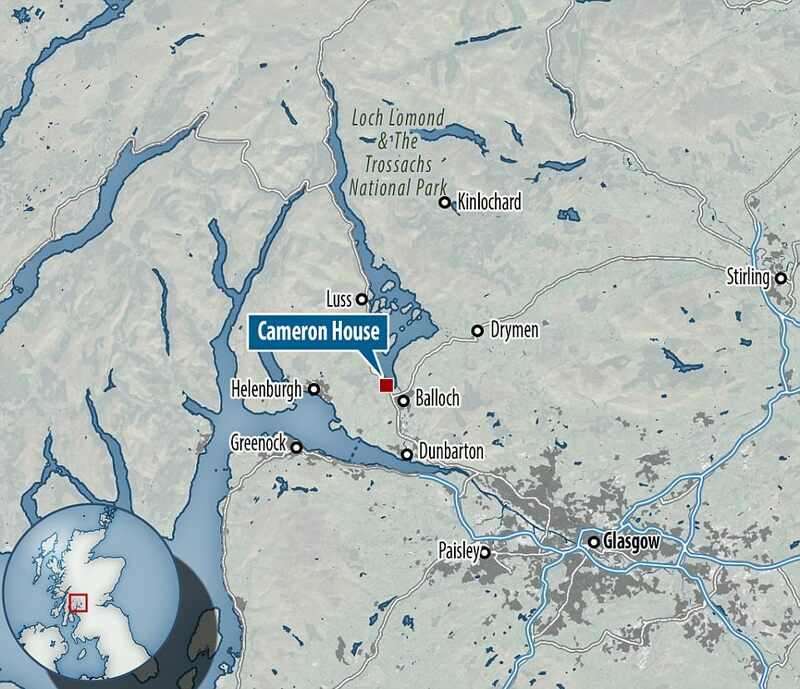 Cameron House has become one of the most popular hotels in Scotland, regularly hosting celebrities and major events. Rooms cost hundreds of pounds per night at the five-star resort which includes a spa, golf courses and a Michelin star restaurant. 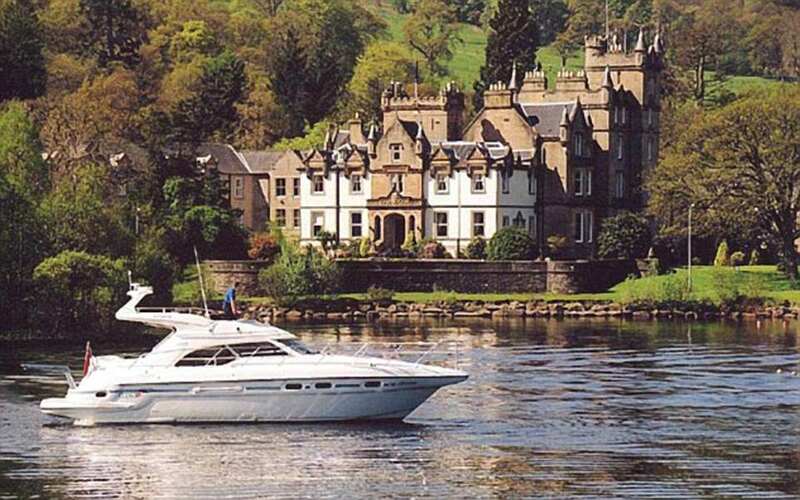 There are also regular cruises of Loch Lomond from the hotel while a seaplane gives aerial views of one of the most iconic areas of the country. As well as the 136 rooms in the main hotel, there are more than 180 timeshare lodges on the grounds. International football teams and music stars, including U2, Cher and Take That, have all stayed in the hotel before performances in Glasgow, around 25 miles away. It is also a popular wedding venue with dates often booked more than a year in advance of the big day. Former British prime ministers Sir Winston Churchill and Sir Anthony Eden both stayed at the hotel, which was previously the family home of 18th century Scottish novelist Tobias Smollett. 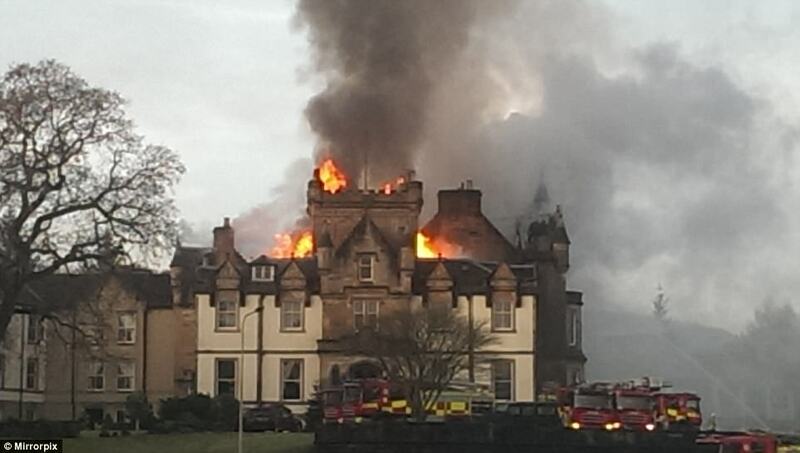 On its Facebook page, Cameron House said the fire was within the main building. The owner of the nearby Duck Bay Hotel has offered to provide tea, coffee and refreshments to emergency services at the scene. 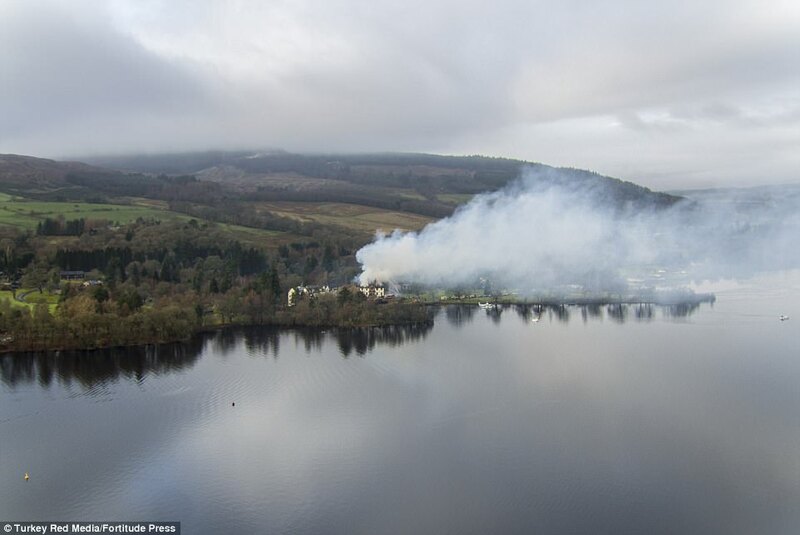 The Long Loch Hotel is also offering help to anyone involved in the fire and offering free tea and coffee. Guests are being sheltered in the hotel's Boathouse restaurant while the situation is ongoing. Cameron House will remain closed to arriving guests for at least the next 72 hours. The Scottish Fire and Rescue Service said officers were carrying out a search of the building, which has more than 130 bedrooms. A spokeswoman said: 'Operations Control has mobilised a total of 12 appliances to the scene. 'Firefighters are currently in the process of searching the building while fighting the fire using powerful water jets. 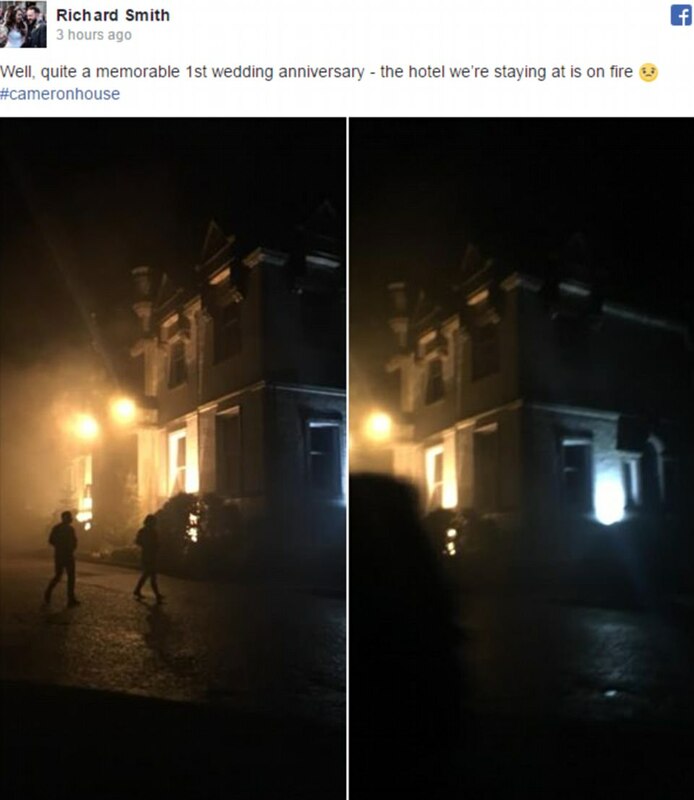 Local MP Martin Docherty described the blaze as 'dreadful news', while Dumbarton MSP Jackie Baillie said: 'Devastating news about the fire at Cameron House. So terrible to hear of casualties at this time of year. Scottish Conservative leader Ruth Davidson MSP said: 'This is a terrible tragedy and my thoughts go out to the families who have lost loved ones and to all those affected. 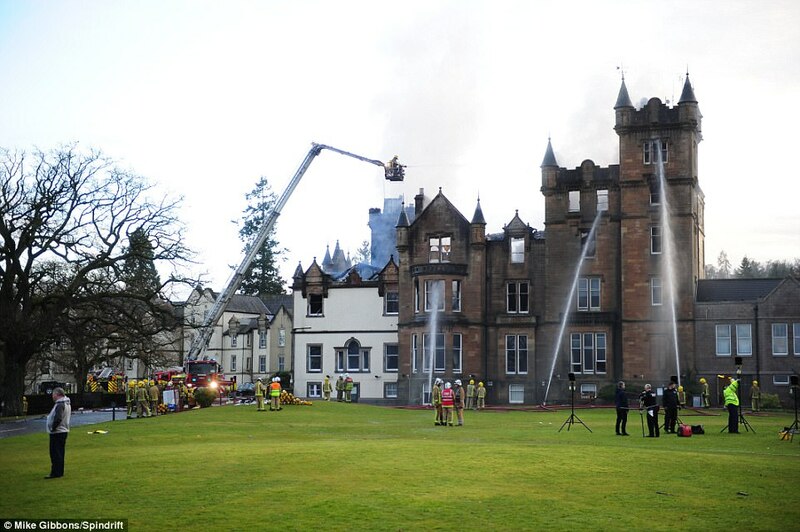 Speaking on behalf of West Dunbartonshire Council, Provost William Hendrie said: 'It is heart-breaking to hear that people have died as a result of the fire at Cameron House today. 'The families of those who have sadly died in such tragic circumstances will need all of our support and I know that the thoughts of the people of West Dunbartonshire will be with them. 'For something like this to happen so close to Christmas is just too painful to comprehend. 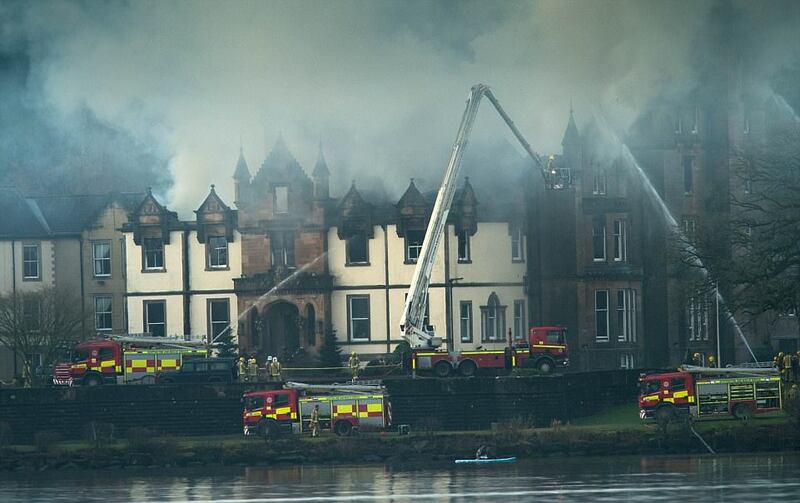 A 40-bedroom hotel on the Welsh border was burnt to a shell today by a devastating inferno in the early hours. Dramatic footage and photographs showed the roof of the Gateway To Wales Hotel in Deeside, Flintshire, engulfed in flames after the blaze took hold at about 4.30am, forcing the evacuation of residents and staff. More than a dozen emergency services vehicles including seven fire engines and four ambulances raced to the scene after the alarm was raised at around 4.30am.